For the city of the same name, see Rensselaer, New York. Rensselaer County /rɛnsəˈlɪər/ is a county in the U.S. state of New York. As of the 2010 census, the population was 159,429. Its county seat is Troy. The county is named in honor of the family of Kiliaen van Rensselaer, the original Dutch owner of the land in the area. 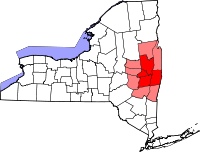 Rensselaer County is part of the Albany-Schenectady-Troy, NY Metropolitan Statistical Area. The area that is now Rensselaer County was inhabited by the Algonquian-speaking Mohican Indian tribe at the time of European encounter. Kiliaen van Rensselaer, a Dutch jeweler and merchant, purchased the area in 1630 and incorporated it in his patroonship Rensselaerswyck. (It was part of the Dutch colony New Netherland). The land passed into English rule in 1664; the Dutch regained control in 1673, but the English took it back in 1674. Until 1776, the year of American independence, the county was under English or British control. The county was not organized as a legal entity until after the Revolution in 1791, when it was created from an area that was originally part of the very large Albany County. In 1807, in a county re-organization, the rural sections of Troy were set off as Towns, and the city was incorporated. The two towns created were Brunswick (named for Duke Friedrich Wilhelm of Braunschweig-Lüneburg) and Grafton (named for Henry FitzRoy, 5th Duke of Grafton). A third town, Philipstown, was set off in 1806. In 1808 it was renamed Nassau after the duke of that area. According to the U.S. Census Bureau, the county has a total area of 665 square miles (1,720 km2), of which 652 square miles (1,690 km2) is land and 13 square miles (34 km2) (1.9%) is water. Rensselaer County is in the eastern part of New York State. The eastern boundary of Rensselaer County runs along the New York–Vermont and New York–Massachusetts borders. The highest point is Berlin Mountain, 2,818 feet (859 m) above sea level, in the town of Berlin. The lowest point is 62 feet (19 m) above sea level at the Hudson River's southernmost extent in the county. Depending on precise location within the county, road travel distance to New York City ranges between 132 miles (212 km) and 178 miles (286 km). As of the census of 2010, there were 161,129 people, 62,694 households, and 39,989 families residing in the county. The population density was 233 people per square mile (90/km²). There were 69,120 housing units at an average density of 109 per square mile (39/km²). The racial makeup of the county was 88.73% White, 7.14% Black or African American, 0.23% Native American, 1.71% Asian, 0.02% Pacific Islander, 0.89% from other races, and 1.34% from two or more races. 5.01% of the population were Hispanic or Latino of any race. 22.3% were of Irish, 14.7% Italian, 12.8% German, 7.5% English, 6.2% French, 5.3% American and 2.3% Puerto Rican ancestry according to Census 2010. 95.4% spoke English and 2.7% Spanish as their first language. There were 61,094 households out of which 33.30% had children under the age of 18 living with them, 46.80% were married couples living together, 12.00% had a female householder with no husband present, and 34.80% were non-families. 27.90% of all households were made up of individuals and 10.30% had someone living alone who was 65 years of age or older. The average household size was 2.46 and the average family size was 3.02. In the county, the population was spread out with 24.20% under the age of 18, 10.10% from 18 to 24, 29.10% from 25 to 44, 23.00% from 45 to 64, and 13.60% who were 65 years of age or older. The median age was 37 years. For every 100 females there were 95.90 males. For every 100 females age 18 and over, there were 93.70 males. Beginning in 1791, Rensselaer County was governed by a Board of Supervisors, which acted as the Legislature, with the chairman of the board serving as a de facto Executive. The Board of Supervisors form of government was terminated as a result of a class action lawsuit brought by Troy attorney Marvin I. Honig on behalf of his wife, Nedda, during March 1968. Mr. Honig brought this lawsuit to declare that the Board of Supervisors, as constituted, violated the "one man, one vote" principal declared by the United States Supreme Court. Mr. Honig's motive in bringing the lawsuit was to punish the Rensselaer County Republican Party chairman and certain members of the Board of Supervisors for defaulting on an agreement with him. The NY Supreme Court ruled in Honig's favor, and ordered the creation of a legislative body. Several plans were offered, but a plan proposed by Honig was adopted by the Court, and its decision was affirmed by the Appellate Division and Court of Appeals. The first "Honig Plan" was drawn to favor of the Democratic party, which had not had control of the county government in decades. That plan, which controlled the 1969 election, resulted in the Democrat's winning control of the new Rensselaer County Legislature. Thereafter, following a change of leadership in the Republican party, Honig brought a new plan, drawn to favor Republican candidates, to the court, which adopted his revised plan. The second "Honig Plan" was affirmed by the Appellate Division and the Court of Appeals. The Republican candidates won back the County Legislature in the 1971 election, and Honig became the Renssselaer County Attorney, a position he held for well over a decade. A full explanation of the creation of the Rensselaer County Legislature can be found at http://nassau-stories.blogspot.com/2006/04/reapportionment.html. See also: The Troy Record, July 8, 1971, page 1. The private, coeducational Doane Stuart School is also located in Rensselaer County. ^ "Rensselaer County History". Rensselaer County Historical Society. Retrieved July 3, 2018. ^ Rensselaer County School Districts. Archived 2009-02-07 at the Wayback Machine Capital District Regional Planning Commission. Retrieved 14 October 2008. ^ Questar III Component School Districts. Archived 2010-07-07 at the Wayback Machine Questar III. Retrieved 14 October 2008. ^ "Doane Stuart School Profile - Rensselaer, New York (NY)". www.privateschoolreview.com.